This book is written from a secular point of view. The author does not use Christian principles nor does he profess to be Christian. Should you be looking for a Jesus-centered approach, this book is probably not for you. But I have heard of some people benefitting from this book to various levels of degree. "... a ground-breaking work by the nation's leading professional expert on sexual addiction, based on the candid testimony of more than one thousand recovering sexual addicts in the first major scientific study of the disorder. 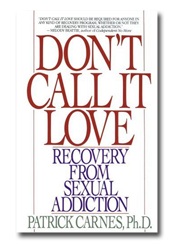 This essential volume includes not only the revealing findings of Dr. Carne's research with recovering addicts but also advice from the addicts and co-addicts themselves as they work to overcome their compulsive behavior."